2011 Locavore, originally uploaded by photographerpainterprintmaker. Windsor & Essex County Plein Air Society will be painting at the John R. Park Homestead during this event. We will also be there for the Blueberry & Lost Arts Festival which takes place following this brunch, and the Saturday before. 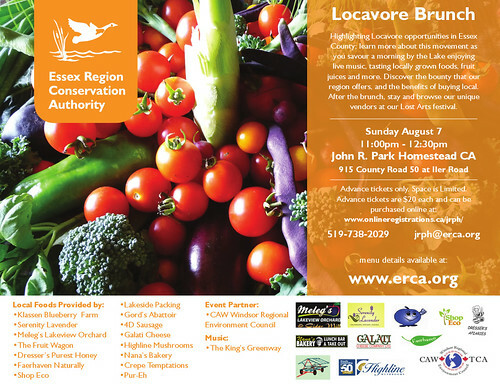 This event highlights Locavore opportunities in Essex County. You can learn more about this movement as you savour a morning by the Lake enjoying live music, tasting locally grown foods, a fine array of local fruit juices and more. Also local farmers, food producers and vendors will be on hand to share their specific knowledge about their products, the delicious bounty that our region offers, and the benefits of buying local. The 2011 menu for the Homestead will include: bacon, sausage, crepes with local maple syrup, fresh blueberries, peaches and other fruits, assorted salads, fresh breads, bocconcini cheese, mushroom sautee, gazpacho, lavender lemonade, apple cider, and more! Be sure to attend this unique event to ‘green your eats’. Advance ticket sales only. Last year’s event was sold out! The Homestead is located at 915 County Road 50, east of Colchester on the Lake. Saturday Aug 6 and Sunday Aug 7 Noon – 4: P.M. Celebrate the blueberry season with crafts, blueberry pie and ice cream sundaes, live music, and games for children. Pick your own berries at the Klassen’s Farm just east of the Homestead. This year’s event features the ‘Lost Arts’ theme – see reenactors demonstrating trades and arts from the 19th century and participate in the fun. Demonstrations will include: basket weaving, blacksmithing, wood carving, painting, quilting, and more! JRParkSmithyBarnDSC_3627, originally uploaded by photographerpainterprintmaker. What a busy busy time! 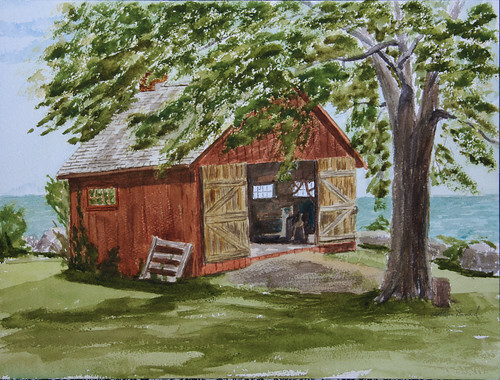 This weekend our Plein Air group painted at the John R. Park Homestead for the Explore the Shore annual event. This was our first year, but not the first year that the event was held. The John R. Park Homestead is a historical site managed by the Essex Regional Conservation Authority, or ERCA. They have always been very accommodating to our club. The grounds are a Plein Air Painters dream come true. Even though it was incredibly hot this weekend we had a good breeze coming off the lake to keep us cool. Well, as cool as possible in the extreme heat and humidity that we’ve been experiencing this summer. Saturday’s painting is ready for the paper making machine. I was not at all pleased with it. Although, I may try to salvage it as part of it turned out acceptable. Sunday’s painting however turned out quite nice. We had a great spot under the chestnut trees in front of the blacksmith barn. I used my Arches Watercolour block that I bought in San Diego. I’m happy with the results. 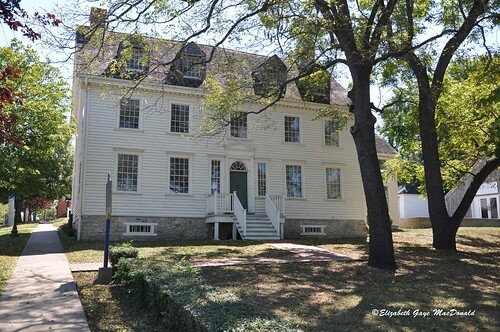 John R Park Homestead, originally uploaded by photographerpainterprintmaker. 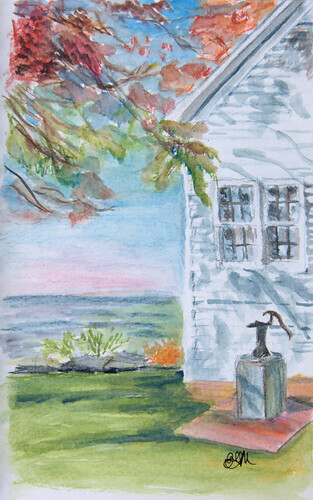 Painting of the House and pump. 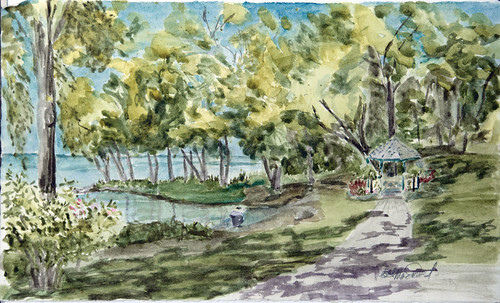 Plein Air at Lakeside Park Kingsville June 13th. lakeshoreDSC_3411, originally uploaded by photographerpainterprintmaker. It was a beautiful day to paint in this lovely park. Teachers from different grades brought their students for a picnic. Rambunctious boys ran in and out of the gazebo. Seniors strolled with their dogs, a pole walking class exercised with their instructor, and seven Plein Air Artists from the Windsor & Essex County Plein Air Society enjoyed many different views. Days like this don’t get any better. 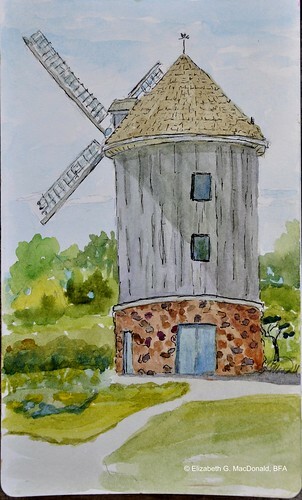 Plein Air at Lakeshide Park Kingsville June 13th.